If you wish to contact Cash Register Services regarding any items or services relating to our business, you can do this using one of the variety of methods below. For directions on how to find us, simply click on the google map "direction" link on the right of the screen. Office Hours: 0900 - 1700 Monday to Friday. Engineers Hours: 0900 - 1700 Monday to Friday. Out of Hours Service* - 0900 - 1700 Saturday and Sunday, plus public holidays. Please note : Out of hours service - please contact us for details during normal office hours. Cash Register Services are based in the City of Kingston Upon Hull, East Yorkshire. The map on the left shows the area we cover. Our engineers are able to travel further depending on the nature of the call, so please call us for individual cases. 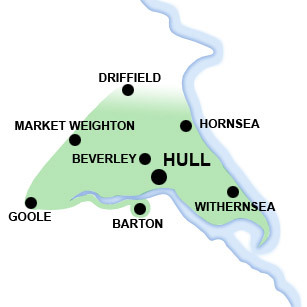 Barton Upon Humber and surrounding villages.